Studio Athletica | Downtown Toronto Hand Physiotherapy - Call Now. Below you will find a list of symptoms and conditions that we see at Studio Athletica with our Downtown Toronto hand physiotherapy clientele. At Studio Athletica, we specialize in several different services that can help treat your health problems. Please feel free to read more about your symptoms, conditions and our suggested treatments, or contact us to pinpoint the best treatment to heal your body. The downtown Toronto hand physiotherapy program is the gold standard. 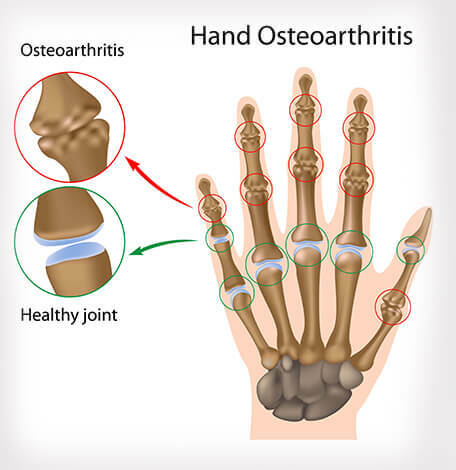 Our Downtown Toronto hand physiotherapy program sees a lot of osteoarthritis. Osteoarthritis is the most common form of arthritis. It occurs when the protective cartilage on the ends of your bones wears down over time. It can occur with any joint in your body however, the disorder most commonly affects joints in your hands, knees, hips and spine. Osteoarthritis symptoms can usually be effectively managed, although the underlying process cannot be reversed. Staying active, maintaining a healthy weight and other treatments may slow progression of the disease and help improve pain and joint function. The symptoms include pain in the joints during or after moving, tenderness when applying light pressure to the joint, stiffness, loss of flexibility, grating sensation in the joint, and bone spurs. Our Downtown Toronto hand physiotherapy program sees a lot of finger dislocations/sprains. Sprains and dislocations of the finger joints are one of the most common injuries to the hand. When a sprain occurs, it essentially means that the ligaments around the joint are either stretched, twisted, or torn. A dislocation happens when one end of a joint is moved out of its normal position. A dislocated finger is caused by a jammed with a considerable amount of force against an object such as during sports, a baseball may strike the tip of a finger. or the finger may be forcefully overextended. 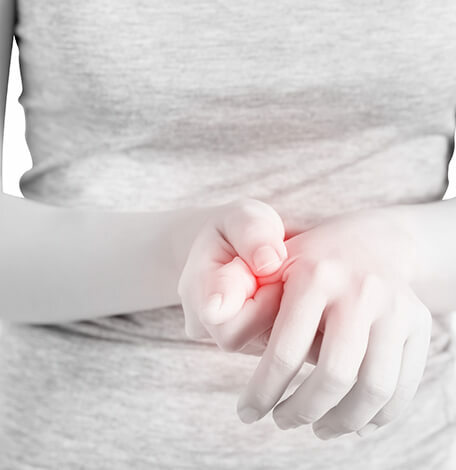 If the pain in your finger is associated with numbness, a tingling sensation, as well as appearing pale, it is likely the finger is dislocated. Our Downtown Toronto hand physiotherapy program sees a lot of skier’s thumb. Skier’s thumb describes an injury to a ligament in the thumb, the soft tissue that connects the bones of your thumb together. Despite the term “skier’s thumb” this type of injury can occur during any day-to-day activity that creates a force to stress the thumb and stretch or tear the ligament such as jamming into packing snow while holding a ski pole or during an automobile accident while holding a steering wheel. If you have skier’s thumb, you will likely experience pain at the base of the thumb, swelling, inability to grasp things between your thumb and index finger, blue or black discolouration around the thumb, pain in the wrist, and tenderness to touch.